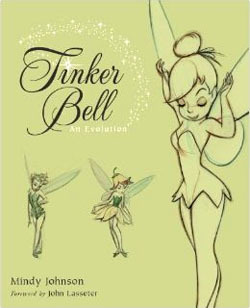 I just received a copy of Mindy Johnson’s wonderful new book Tinker Bell, An Evolution. It’s definitely a welcome addition to the Walt Disney bookshelf. No supporting character (Figaro? Scamp? even Jiminy Cricket?) from a Disney feature has ever become as popular – or more popular – as each year goes by. Her fame has allowed for this book to be and the good news for Disney historians – the character is worth the “art-book” treatment, and Johnson did her homework. Johnson covers it all (only the last thirty of its 192 pages are devoted to the more recent “Pixie Hollow” persona) and, as you’d expect from a Disney Editions publication, its lavishly illustrated with art from the archives. The text starts with a thorough history of J.M. Barrie and the earliest Peter Pan plays and silent movies (there’s a great publicity photo in this section I’d never seen before, of Betty Bronson – star of the 1925 Paramount Peter Pan – posing with a standee of the 1953 Disney feature). 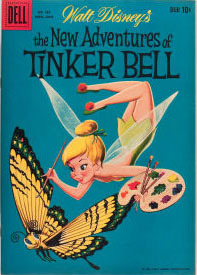 Johnson devotes the next chapters to the development of the Tinker Bell character – beginning in 1935 and illustrated with rare drawings, story sketches, paintings and model sheets along the way. Over a hundred pages go by before we find Tink in her final form – in model sheets and numerous photos of the staff (Marc Davis, Roy Williams, Milt Kahl, Ham Lusk, among others) sketching models (including Ginny Mack, Katherine Beaumont and of course, Margaret Kerry). 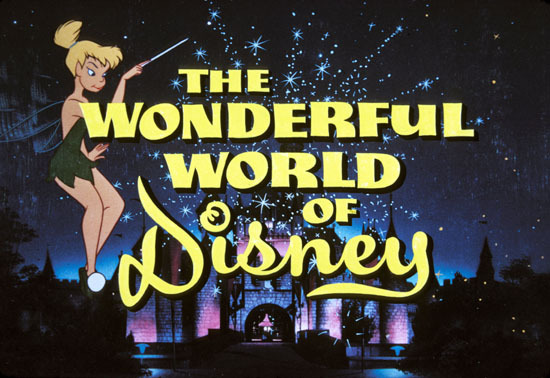 Tinker Bell beyond Peter Pan is pretty interesting – as the character had an immediate afterlife that included the Disney’s TV shows, Peter Pan Peanut Butter commercials, aerialists at Disneyland, comics books and much merchandising. Up to her cameo in The Black Cauldron (1985) and her final scene appearance in Who Framed Roger Rabbit (1988) the book had me interested and intrigued. Pretty much everything I wanted to know about the character is here and documented with care. So here’s to Tinker Bell – and to author Mindy Johnson. You did good. As for Disney Editions, I’d love to see such art book treatment given to other secondary characters – perhaps The Seven Dwarfs or the Cheshire Cat? Heck, I’ll take a tome devoted to Humphrey Bear? Who’s with me? Sounds very interesting. Well done Tink. Of another character that I kinda like to see to have an art book would be Pluto. Out of all the Disney characters that had a long-term theatrical series, I don’t think there was art or history book dedicated to this character. Unfortuantly, I can understand why as it’s no secret that his series is the least favored to Disney and animation fans (athough he had some good entries). Not to mention the fact that his main director seemed so attatched to Pluto, that when he directed the final cartoonsof his owner and star of the studio, Mickey, the director seem to forget that the mouse is suppose to be the star of his series and not his dog. Plus, unlike Mickey, Donald, or Goofy, the dog hasn’t really headline anything besides the shorts and few comics. Despite being a favorite to some people (including Disney Archives founder, Dave Smith), I doubt anyone reading this site will be intrested in- let alone do-a book about this bloodhound. Pluto would be interesting. I would also like to see a book on Oswald the Lucky Rabbit or Jiminy Cricket as both have rich histories. I get it, Thad. I know David has a big dislike to the dog. Grrr! I have been trying all year to request review copies of “Tinker Bell, an Evolution” and other Disney Editions titles, to review them for Animation World Network, and all of my requests have been either ignored or returned as undeliverable. Disney Editions is the only major publisher of animation-related books whose titles are apparently going unnoticed on AWN — but it’s not by our choice. Shame you get ignored like that. I just got my signed copy at the College of the Canyons campus bookstore in Santa Clarita (the author is an instructor there). It includes a matching bookmark! $40 cheap!! We picked up a copy of “Tinker Bell: An Evolution” at the D23 expo just as the boxes were being opened and had it immediately shipped home. Went back for a second copy an hour or so later and we’re told they were sold out. Later we found out that this original print run only had the authors name on the dust jacket but nowhere in the actual book! OOPS!! We were told that all copies were pulled and destroyed due to the error. When we received our copy, the book doesn’t include the authors name anywhere. Just wondering if anyone else heard about this, can verify what occurred and got one of these?